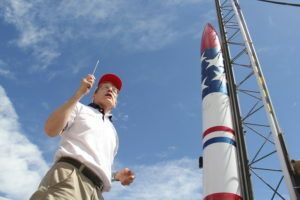 The FAA published regulations that create several new classes of amateur rockets. The two classes of most interest to NAR members are Class 1 and Class 2. As long as the general operating limitations at 14 CFR 101.23 listed below are followed, they can be freely launched. Does not create a hazard to persons, property, or other aircraft. The FAA may specify additional operating limitations necessary to ensure that air traffic is not adversely affected, and public safety is not jeopardized. The Class 2 rocket category covers high power rockets with up to 40,960 N-s total impulse. The rules require prior authorization before launching. This is part of the operating limitations at 14 CFR 101.25. Operating limitations for Class 2 High Power Rockets. You must comply with the General Operating Limitations of § 101.23. Unless reasonable precautions are provided to report and control a fire caused by rocket activities. To apply for authorization, you need to obtain an Application for Waiver or Authorization, FAA Form 7711-2. You will have to file your application with one of the FAA’s regional offices and their contacts. Applications must be filed not later than 45 days prior to the date of proposed operations. Plan on applying for authorization as far in advance as possible. Launch participants will want to know the altitude limits and other special provisions when they make their travel plans. While items 5 and 6 are a good match for item 8 on the application the others match nothing. Include that information on a separate sheet(s). Here a sample Appendix. Please note that form 7711-2 was issued in August 2008. Applications must be filed in triplicate, signed, and be accompanied by 7.5 series topographic quadrangle map(s) published by the USGS of the proposed operating areas. These need to be printed out and marked up with depictions of your flight line, launch control point, safety dispatch, and fire control equipment (fire extinguisher normally). We will show you how to make this map easy later in this document. The FAA is charged with ensuring the safe use of a public resource: the airspace above all our heads. The primary way they do their job is by making sure that airplanes work as they were designed and have adequate operational limits, ensuring that pilots and other airspace professionals (like controllers) have been adequately trained and receive recurrent training, and by separating airspace users in operation by adequate distances. It is the latter which will have the most bearing on your application. It’s helpful to have an aviation map for the next steps. The application will ask for information relating to the airspace over your launch site, and the map will help you provide it in a form the FAA understands. Go to a general aviation airport and look for the place where pilots pay for fuel or rent airplanes. Ask the folks there for a “sectional” map. A total of 26 sectionals cover the continental US. Unless you are near a map boundary, the sectional should be the one most used by pilots in your area. You can also get sectional maps on the Internet to use in real time. These can be found at the Sky Vector website. Are there any airports within 5 miles? If so, you will also need to request authorization in accordance with 14 CFR 101.25(e). You may see a variety of wide straight blue lines on the map with arrows on them and letters like “V321” on the lines. These are airways, connections between radio navigation aids for airplanes under positive airspace control. Having any of these near your launch site makes the FAA nervous. Around larger airports, particularly larger cities, you may see airports marked with a variety of dark blue circles surrounding them. These larger airports frequently have high volumes of jet traffic and these circles represent a class of airspace strictly controlled by the FAA. Obtaining waivers under these terminal control areas (TCA’s) is not impossible, however. Be prepared to accept lower waiver ceilings in this case. Other things to look out for include large blue areas marked with something like “P-405” (representing Prohibited Airspace, e.g., the White House, portions of the Grand Canyon, etc.) and “MOA” or Military Operations Areas (practice areas for armed forces pilot training). The military operates MOA’s independent of the FAA, merely telling the FAA when they’re using the area. The FAA cannot control access to these areas, and the military generally doesn’t allow other uses of “their” airspace. The presence of these things should not discourage you from applying for authorization. Most current NAR waiver holders report that the FAA personnel with whom they interacted were courteous, helpful, and professional. Don’t go into the process thinking it is an adversarial proceeding; it shouldn’t be. You will have a better chance of having your application approved if you make your application in a professional manner, and conduct your activities likewise. Keep in mind that the people working on your application are people, and as such they respond to being treated courteously and professionally. Working with the FAA personnel you contact in a cooperative spirit will often bring fruit and establish long term working relationships. Lines 1, 2, and 3 are for your club’s name, name of responsible person (waiver holder), address, and telephone number. Line 4 asks if you have a waiver (assume this includes authorization) pending at any office of the FAA. Normally this will be marked no. Line 5 asks of you have had a waiver denied or a waiver canceled or pulled before. Normally this will be marked no. Line 6 asks for the FAR’s to be waived. While NONE is correct, some FAA offices want to see 101.25(f) here. Also, 101.25(g) is the FAA’s requirement to have non-involved buildings and highways 1/4 of the altitude distance away from the launcher. Some FAA folks have said that if you can show safe reason to waive this requirement you can put this on the line 6 as well and attach your reasons. (2) A public highway on which traffic flow exceeds 10 vehicles per hour, not including traffic flow related to the launch. Normal operations of High Power Class 2 rockets in accordance with the National Association of Rocketry Safety Code (please see attached). Attach a copy of the NAR high power safety code. Line 8 is also the line on which you request altitude. Again, in FAA patois, “No operation under this waiver will exceed 5000 feet AGL” are the magic words (AGL meaning “Above Ground Level”). The FAA measures all flight operations in this language. 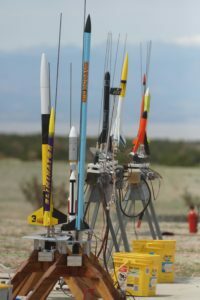 You have to decide how high you want to fly rockets based on rules in the new 14CFR101, NFPA1127, and the NAR Safety code which are now aligned. Please read the NAR safety code and determine what altitude could be allowed based on the surrounding buildings and roads to your launch site. Note that there is a new wrinkle in site planning in that the FAA has imposed a variable setback (1/4 the expected altitude but at least 1,500′) from persons or property not associated with the launch, instead of the previous standard (and NFPA standard) of 1,500′. You may need to take this into account in renewing waivers from previous years. How high an application can be approved depends on what other airspace users might be above your site, and ground conditions specified in the new 14CFR101 and the NFPA 1127 2008. Please study these and determine what is allowed for the size of your site. The FAA generally likes to have 500 to 1,000 foot separations between users. Example: for NARAM-33, the minimum descent altitude above the site for airplanes into O’Hare was 2,200 feet AGL, making 1,700 feet AGL the waiver altitude ultimately assigned. If you can read the altitude of the terrain on the section map, you can add this to the requested altitude above ground level to arrive at the altitude above Mean Sea Level (MSL), which might be appreciated by the person processing your application. Since you will need to markup your launch site operations on the USGS 7.5 maps start out by downloading the map that covers your launch site. If you don’t know the GPS coordinates of your launch site you can use Google Earth to find them. I also use Google Earth to determine the safe distances for roads (over 10 cars per hour that are not involved in the launch) and inhabited buildings not involved in the launch operations. (Some images in Google Earth are more recent than others. Always verify the location of inhabited buildings and check for new ones.) Zoom in to look at the launch area you fly in and look over the buildings and roads not involved in the launch operations. I use the ruler function under the tools menu to measure distances. I can then use “control-prtsc” on a PC to capture this picture and paste into “paint”. Once in paint I can draw circles and line to determine the radius or square of the launch site. 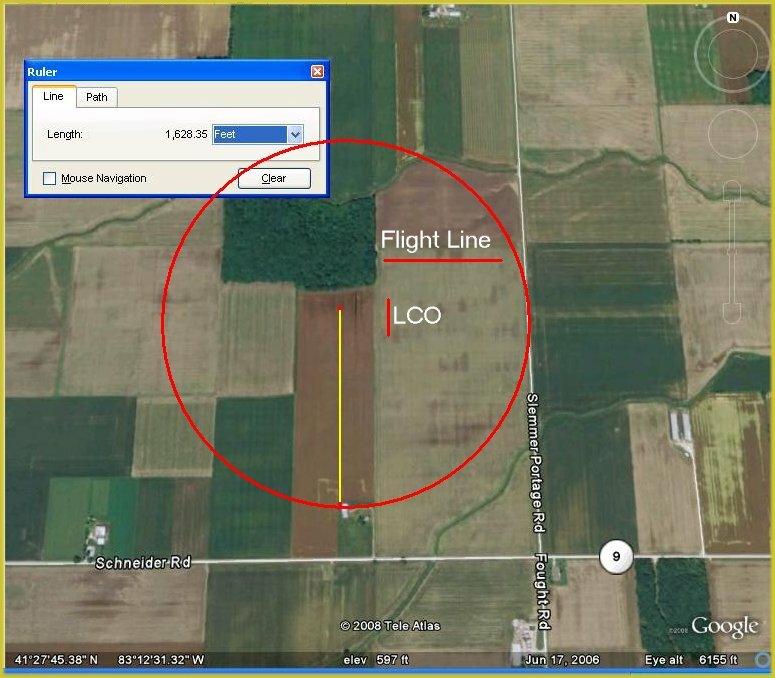 Here is an example of a launch site picture that plans to file for authorization up to 5000 feet AGL: Launch markup. Notice the 1500 foot distance from the inhabited building not part of the launch operations. Markup your flight line and your control area. Now to get a USGS 7.5 series topo map. You need to go to the USGS online store , scroll down and select Map Locator. Click Map Locator that tells you can get downloads for free. This website is confusing but you can get the hang of it. If you get a blank page like I did, scroll down and you will see the information down farther. You should now have a map of the US to select your state from. Follow their navigation instructions, it might take two or three attempts to get the hang of just what it is they want you to do to select the area for the map you want to down load. Press the “+” zoom button and drag the map around to put in the center the place you want to zoom into. Notice the coordinates that change as you move the hand around. Follow the rest of their instructions and switch to mark mode. Place a marker on the launch cite and then click it. It will give you a balloon to click to order or download the map for free. Click download and press save. In a few minutes you will have a PDF of your area saved to your hard drive. Although the instructions indicate that Line 10 should be filled out, ignore it. The remaining information will be on separate sheets you attach, similar to our sample Appendix. Lines 10 through 16 pertain to air shows and the like, so just put an “N/A” or two there to let them know these areas aren’t blank because of an omission. All operations will be conducted in accordance with the NAR Safety Codes and shall be under the control of an experienced Range Safety / Launch Control Officer. A spotter will watch for aircraft entering the operations area, and we will temporarily suspend operations in this contingency. Make three copies and send them to the Regional Office. Keep one additional copy for yourself. Attach three copies of the NAR High Power Rocket Safety Code. Also attach three copies of the maps you have marked up, and include a short cover letter. Received _________________ (date) an Application for Certificate of Waiver or Authorization, FAA Form 7711-2, at this office. For further information, please contact ___________________ (name) at _________________ (telephone number, extension). The office workers see these things all the time, and they know what to do with them. Mail off this packet to the FAA Regional Office, to the attention of Flight Standards. You need to apply at least 45 days or more in advance. If you don’t hear back from them in two or three weeks, give them a call. If all goes according to plan, you should get back your application, all the other stuff you sent, and the Certificate of Authorization. Any other pertinent information requested by the ATC facility. Your Certificate of Authorization may include specific or additional notification requirements. Be sure to follow them. Be prepared for the person answering any or all of these phone calls to be unfamiliar with your operations. If you just tell them you’re carrying out instructions from the Regional Office to give a Notice to Airmen, (NOTAM) pursuant to the terms of your Certificate of Authorization, and/or mention the name of the FAA person noted on your forms, the logjam usually breaks. A little professional sounding talk will make them feel right at home. This notification should result in a NOTAM being issued. You can view NOTAMs (use the “Radius Search”) at this FAA web site. Your authorization will require you to make sure all fliers are familiar with the terms and conditions of your certificate of authorization. The FAA holds the applicant personally responsible for this. Failure to comply with the provisions becomes your legal responsibility and the FAA has the power to fine and prosecute you if they need to. A policy you may consider is to make the certificate and application available for inspection by all fliers and to include key provisions, such as maximum altitude, in your pre-launch fliers briefing. The FAA will also probably include a provision in the certificate allowing them to “pull” the certificate at any time. This allows them to adjust for any unusual conditions that might cause your operations to interfere with other safe operations. After the launch, I send a letter to the person who sent me the Certificate of Authorization, thanking them for their help, and letting them know we had a safe and enjoyable time. It helps grease the skids for the next time, besides being common courtesy. It is your responsibility to ensure that the authorized altitude is not exceeded. You should ask your fliers to provide the basis for their altitude estimates when they check in at the RSO table. In some cases, simple experience is sufficient (e.g., a 4″, 3 pound rocket on an H128 is in no danger of exceeding 20,000 feet AGL). If in doubt, require a computer flight.